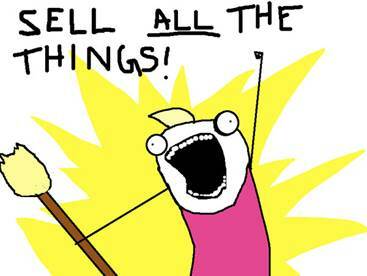 I’ve scored a lot of items for a song on Craigslist, in thrift stores, and off local exchange websites. But this. This one is for the books. 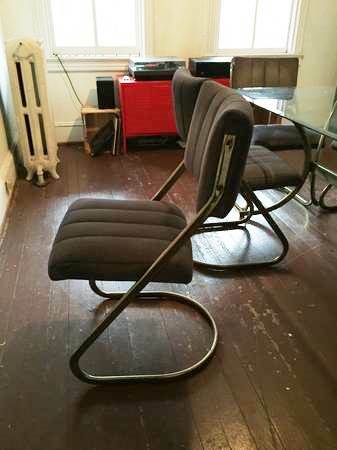 These chairs may not look like much at first, but trust. Ugly right? Even hideous? Sure. And keep in mind this photo has also been heavily edited from the original Craigslist post which was so dark I could barely tell how many chairs there were. But I was smitten from the get-go. 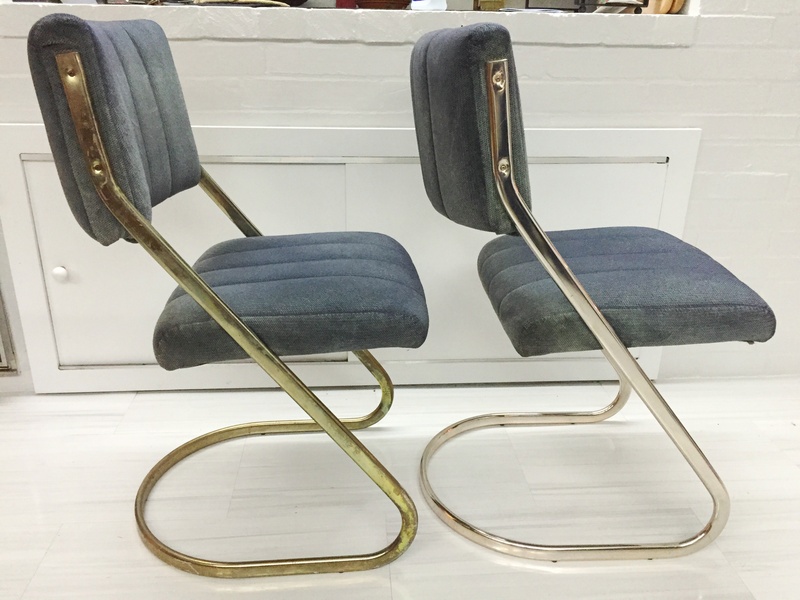 I’ve been on the hunt for some vintage upholstered chairs with metal bases for at least a year. Our dining room table is very nice with clean modern lines, but it’s also very dark. I considered getting a new table, but the one we have is beautiful, of great quality, and it has two leaves which come in very handy during the holidays. Finding a table with similar qualities in a lighter toned Scandinavian style (and within budget!) was a tall order. 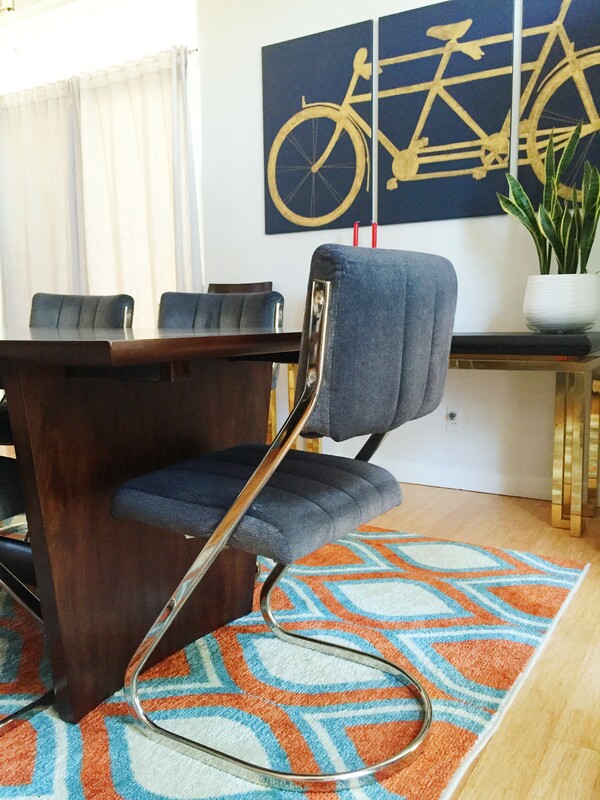 Minimalist tables just don’t come in 100″ lengths like I was looking for so I decided pretty early on that swapping out the chairs was my best bet. Here was the current state of our dining room. Not bad, but definitely dark and the traditional wood chairs were dragging it down. I knew the whole space could benefit from the addition of a few fun and unexpected pieces. 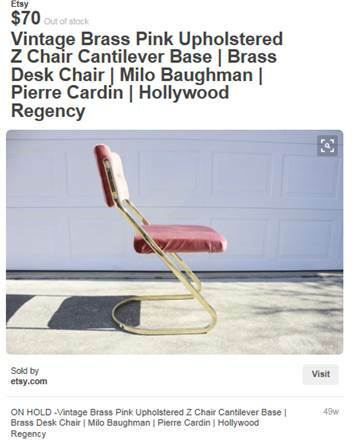 So I knew I didn’t want more wood chairs even though the vast majority of MCM chairs available are teak (and fabulous!). Instead I wanted to contrast the existing darker table with some metal framed chairs that would give us a bit of an eclectic vibe. And blue! I was jonesing for blue upholstery to coordinate with the blue in the rug and with the blues in the adjacent living room. That’s asking a lot for a vintage find, but I was open to recovering them for the right price. The right price being under $250. It was a tall order for sure and most the chairs I found were thousands of dollars for a set of 6. Some of the best deals were in the $600-800 range which was still way more than I was willing to spend on something we didn’t need. Enter patience with a side of persistence. I checked Craigslist multiple times per week for months and months. Maybe years. I’ve lost count. 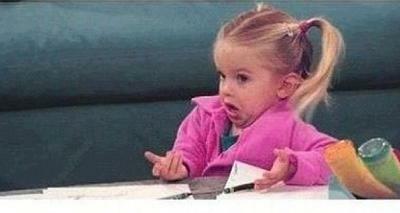 That’s also when I dropped the bomb that they were all the way down in DC (about an hour away). He wanted to know if they were going to fit in our minivan with the two car seats. I sent him this. That’s what I told him and that’s what I did. 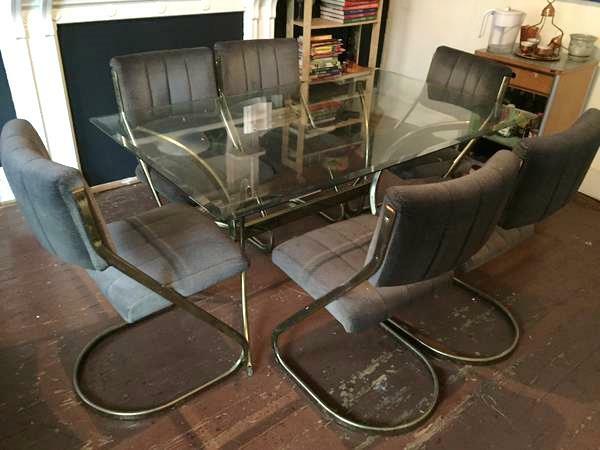 I sold 8 of our dining chairs for $150 and picked up these vintage babies for $120. But oh my God. They were bad. So bad. Far worse than I imagined. I couldn’t even look my husband in the eye as we loaded them into the back of the van. They were horrid. I was scared to look too closely at them and so at first (based solely on the fantastic case of heebie jeebies they gave me) I assumed the upholstery needed a comprehensive (and perhaps professional) cleaning. In fact, I spent the whole drive home on my phone trying to figure out where I could rent a steam cleaner with upholstery attachments (Home Depot, if you need one). But when I got them home and brought them in I realized that the upholstery was actually in exceptional condition. It was the metal frames that were wrecked. The brass frames were so badly tarnished and splotchy that I was worried I was going to need to paint them (not at ALL ideal, but if you ever have to go this route I feel a glossy white or black would make it look more intentional than a faux metal tone). But I decided to try to clean them before I did anything drastic. 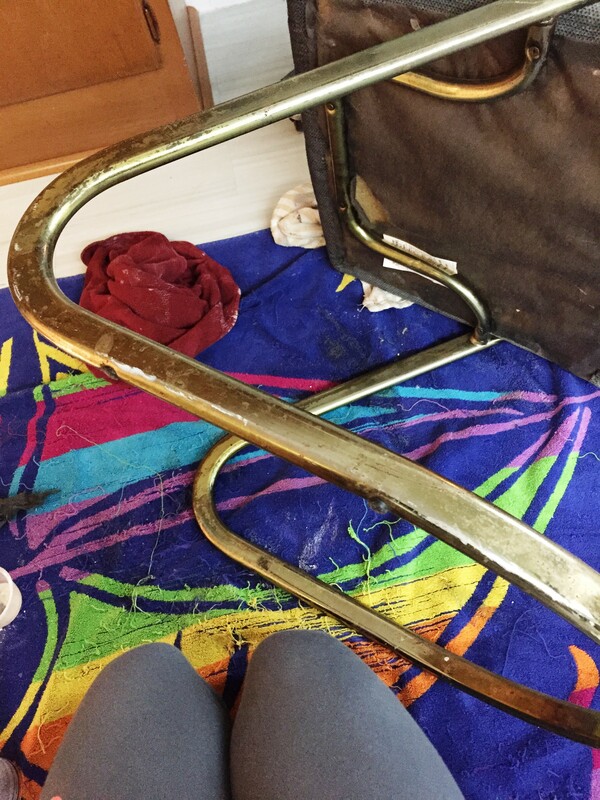 I used hot water, Bar Keeper’s Friend, and steel wool and was amazed that the brassy tone started to come right off and reveal near-perfectly preserved steel frames underneath. My best guess is that these chairs were kept in a storage unit without temperature control. 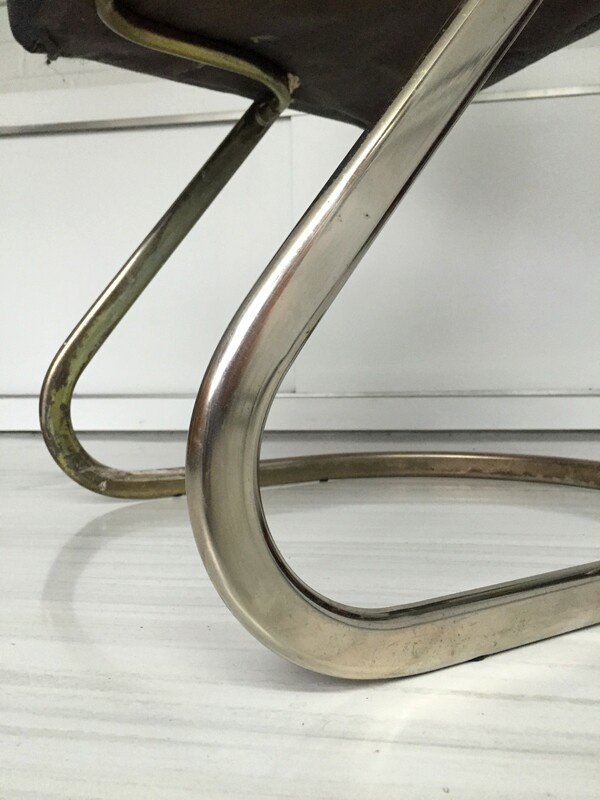 That would explain how the upholstery stayed pristine while the frames suffered. The leg in the foreground here has been scrubbed clean while the leg in the background is still untouched. I’m still not certain if I simply removed decades of tarnish or if I removed some sort of faux brass finish (though I’m leaning toward the latter). 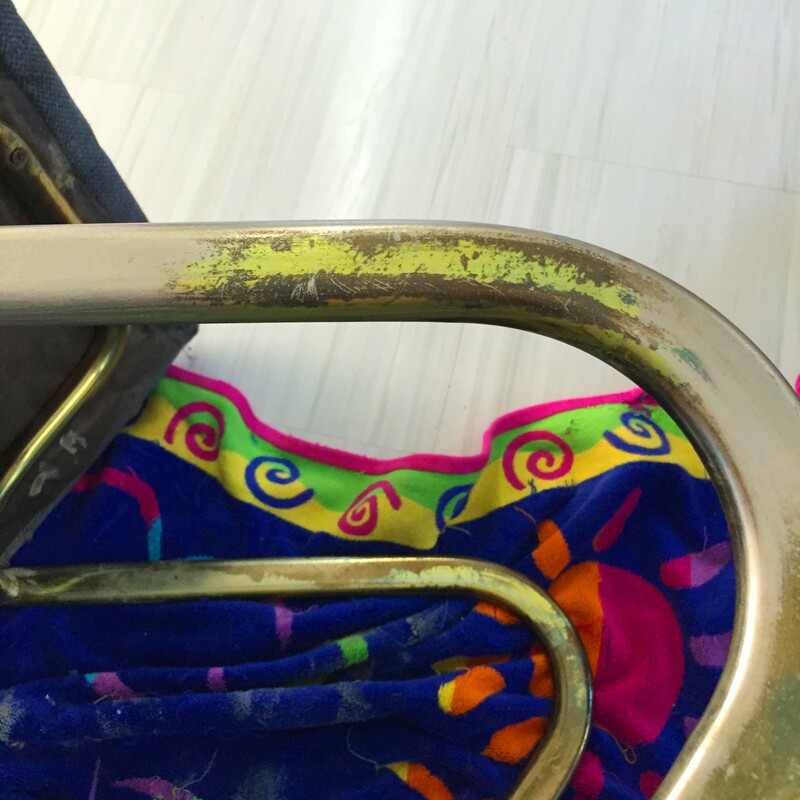 It didn’t flake off or anything … the brass tone just slowly rubbed away. It took roughly one hour to restore each chair. Rather than disassemble for cleaning I opted to use duct tape to cover and protect the upholstery where it touched the frames. 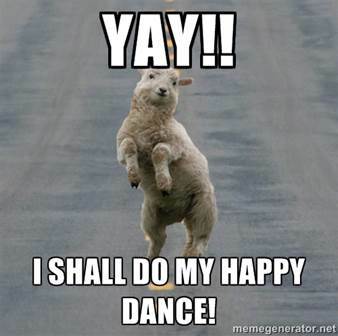 Then I just went to town with the steel wool and cleaning agent. It was messy work and not easy. My initial excitement drove me to finish two chairs that first night before I petered out and then I worried I wouldn’t find the motivation to finish the remaining four, but some how I managed to get them all clean within a week. When the frames were sparkling I simply removed the duct tape and just spot cleaned the fabric with Shout. Amazingly, not a single seat or backrest was stained! It was hard work and my body is still aching from the effort, but it was SO worth it. Who knew these beauties were lying in wait under all that ugliness? The chair on the left is the condition I brought them home in and the chair on the right is all clean and shiny. And here’s how they’re looking in the space. I’m digging the mixed metals look and how the steel plays with the brass chandelier (read about that here!) 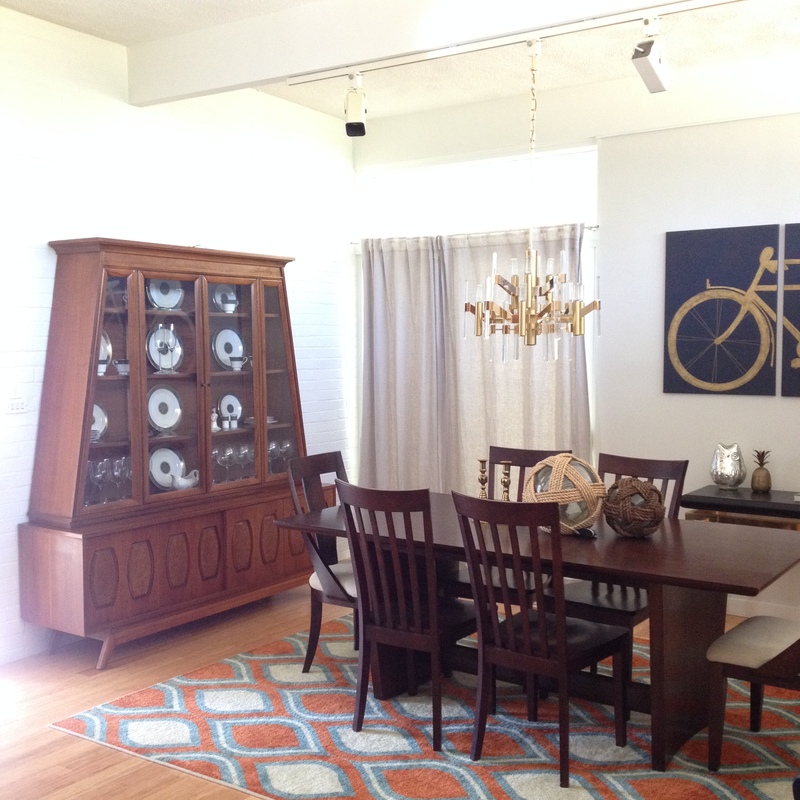 and the gold tone sideboard and bicycle art. 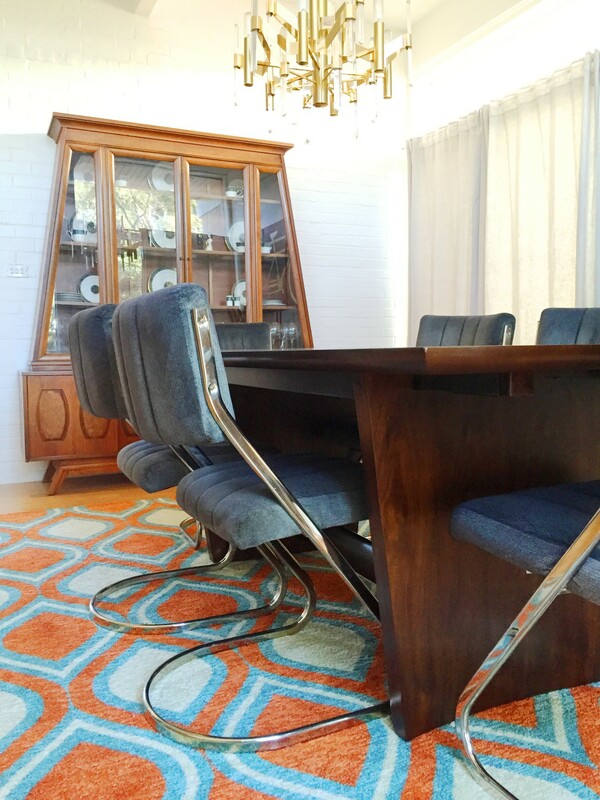 I kept the two formal end chairs from my old set (these were actually purchased from Scan with the table — the 8 chairs I sold were cheapos from Value City). Not sure what my plan is for them yet, but for now they’re flanking the sideboard. The upholstery is perfect! Up close it’s actually a turquoise velour intermixed with navy so from farther away they just look like a deep blue. 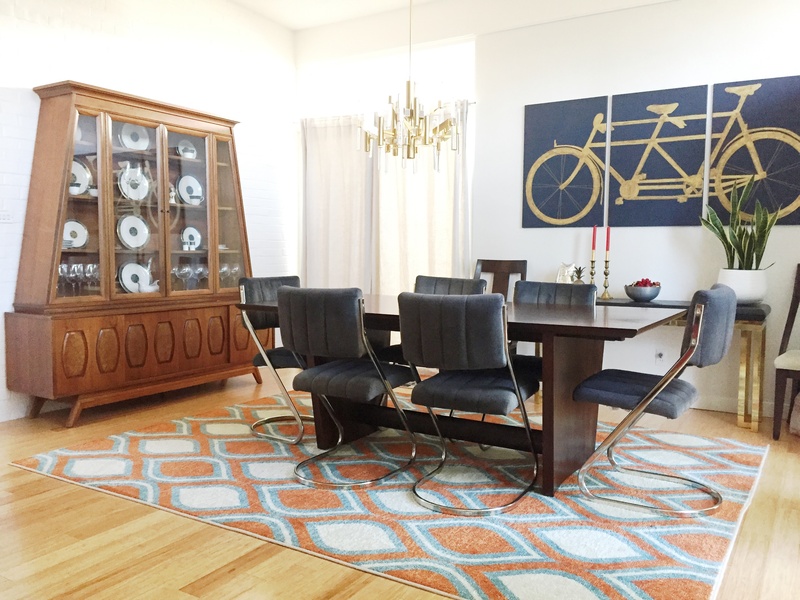 The color coordinates both with this rug and the new turquoise rug 5′ away in the living room — it has the exact same two shades of blue. Ever experience small things in life that just couldn’t possibly sync any better? This is one of those happy accidents that makes me feel like I’m on my right path. Cheesy, but true! So now I have $30 in my pocket, arms of steel from all that scrubbing, and a pretty fun dining room that I’m over the moon about. Life is good. 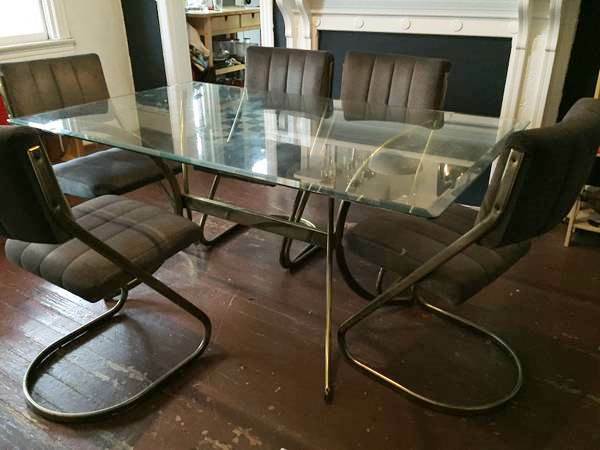 I looked these chairs up on the internet using search terms such as “cantilever dining chair” and “metal Z chair” and found a few similar ones for $70-140 each — only one full set of six and it was sold for $800. So yeah, I’m pretty tickled with this find. Can’t wait to see what finds me next! I am a wife, mother, and writer. I am also a crafting, furniture-refinishing, home-designing nut. Olivia! They look SO good. 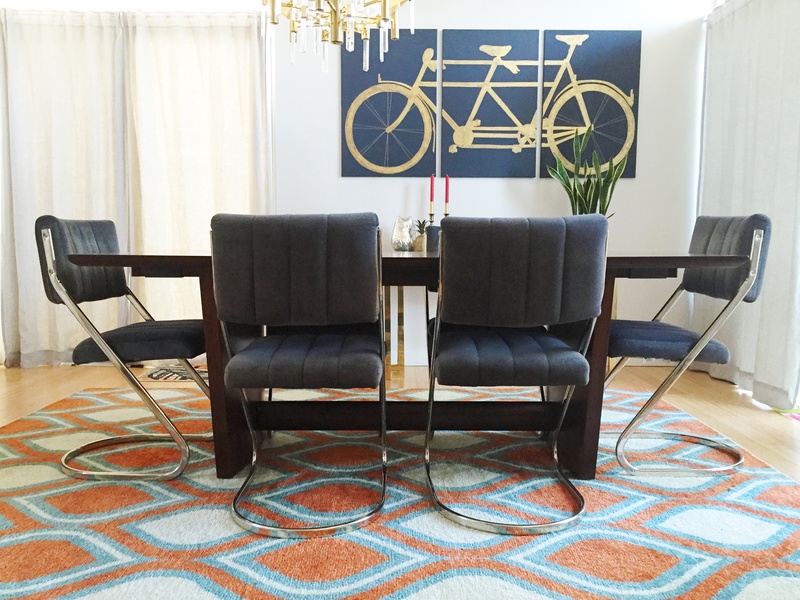 Your bicycle art piece looks so cool with them too– love how the angles are echoed by the chairs. Bravo! Very coo!! I had not noticed that. If at all possible, I now love them even more! We bought a house…And it needs help. I'm not gonna lie--we're not handy. Like, at all. My idea of fixing something usually involves a contraption rigged from duct tape and a clothes hanger while my husband simply declares "It can't be fixed!" and throws down his screwdriver in disgust. This, of course, is a growing concern as we have recently embarked on a major home renovation project. If you've stumbled on this site looking for a how-to tutorial you have seriously lost your way. Run. No, really. Still here? Well, if you choose to stick around, I can promise you this--our adventures in home repairs should at the very least make for some interesting reading!